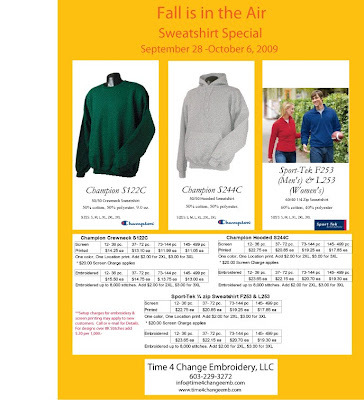 Champion 9.0 oz 50/50 Crewneck/Hooded and Sport Tek 60/40, 1/4 zip sweatshirt sale going on now until October 6, 2009. Click on flier to view a larger version. If you have questions please contact us at Time 4 Change. All small business owners in a struggling economy know how difficult it is to run a business and keep it going strong. Imagine having a family run and owned business see all the various economic cycles we have faced in the last 100 years including the Great Depression, World War II, and Recessions. That is exactly what our friends, neighbor and customer United Shoe Repair have done and they are still going strong. This is not a small accomplishment; it is a Major Mile Stone! As manager/owner of Time 4 Change Embroidery I congratulate them on their “100 Years” of success and service to the Greater Concord Area! We look forward to working with them for many years to come!